I recently had a full circle moment that I wanted to share with you. 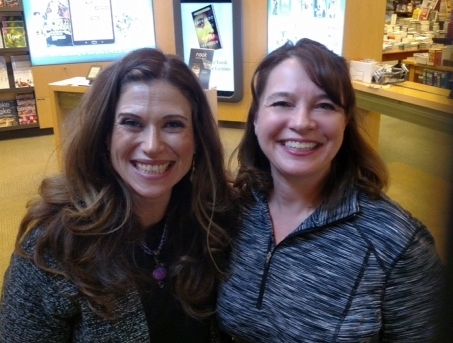 A short time ago, I was able to attend a book signing for Sarah Ballantyne’s new book Paleo Principles. You may know her as “The Paleo Mom”. She was warm, gracious and very giving of her time. I was thrilled to meet her not only because her books are wonderful, but because I had a history with her that she didn’t even know about. Several years ago I became ill and I basically couldn’t find any doctors to help me. Instead, I was given dangerous amounts of steroids and numerous medications. I was flat out scared and not getting better. I remember when I had my health epiphany and everything changed. I was trying to sit up straight in one of my doctor’s office and he came in with yet another medication. It bothered me that no one was thinking about why this was happening to me. I pressed him about what was causing all of this. With an indifferent shrug, he said “How do I know? I don’t know what your day to day life is like.” In that moment, I realized with frightening clarity that he was never going to help me and he didn’t care. And this was the fourth doctor in a three month span. I was backed into a corner. After that, quite frankly, came one of the very lowest points of my life. Was I fated to “live” like this the rest of my life? And if so, could I? When you are chronically ill and especially with something undiagnosed, your world becomes small. You don’t look like you are sick, but you can barely function. I call it “turtling”. You withdraw from family, friends and normal everyday life. You try to hide your sickness, but worry whether your body will cooperate that day. Activities you would take for granted become a war of wills. Only a select few people in my life knew the extent of what I was going through. I found that if you try and explain what is happening, many people may think it’s all in your head or look at you like you have three heads! You lose friends, you don’t share, you feel lonely and isolated. Lucky for me, I had one friend that I opened up to at my lowest point. She was understanding and urged me not to give up. She said there was different medical help out there and encouraged me to start reading some books that she felt could be helpful. The first book she recommended was the “The Paleo Approach” by who? You guessed it! Sarah Ballantyne! Well for those of you who don’t know she is – Sarah has a Bachelor of Science in Physics, a doctorate degree in medical biophysics and spent many years doing medical research. Her resume is impressive and she has earned many awards. This means she bases her explanations on science and scientific studies. For someone who had firmly believed in western medicine this was a perfect first book because I needed that technical basis. Her new book “Paleo Principles” is a hefty book steeped heavily in details and explanations on almost anything you want to know food-wise. As Sarah said at her book signing, it’s important to not only know what foods are “good” and which are “bad”, but WHY they are. Knowing the “why” helps you to make better decisions. In this I completely agree. As I read her first book, I could not believe what I was discovering. Along with Sarah’s book, I had bought 3 others and I literally devoured them in 4 days. My mind was being blown by what I was discovering. That was the start of an extensive library I now possess. When I started to Google to find out more, I was startled by how easily I was finding this “new” information. Too bad my ex-doctors either couldn’t read or Google. As I have said to my husband, “Now that I know this information, I can’t unknow it”. This was the start of quest for me, which I am still on. And my beliefs and what I focus on has majorly shifted. And it all started with that book. I believe this wild ride I have been on makes me a better health coach. I recently had a consult with a new potential client, who said to me, “Well, I bet you are rail thin and perfect.” Ha! Nope. None of us health coaches are perfect. We might from time-to-time eat cookies and drink wine (maybe not in that order). Have I made major changes in my eating, environment and health? Hell yes! I have changed many habits and turned my health around. But I am not perfect – I am human. I am still working on improving my health. It’s these struggles that in fact make me a good health coach. I understand and I know how difficult change can be and that you are going to have setbacks. That is why I am here. I get it. Going to Sarah’s book signing made me reflective. It has been a “journey” (even though I think the word journey is overused). From the moment, I started to read her book until now so much has changed not only physically, but so many of my core beliefs actually changed. And as I waited in line to have Sarah sign my book, I wondered how I would be able to tell her all I had been through and what this book signing meant to me in about 30 seconds. As I fan-girled out, I managed to mumble a little of my story to which Sarah was receptive and kind. I look forward to reading Sarah’s new book and if you are out there at your lowest moment or feel lost – there is help out there. I had to do it on my own, but you don’t. Contact a health coach today and get the support you need and deserve.